Do you love the Meerkats? It’s one of the most successful marketing campaigns of recent years, I would imagine and love them or loathe them, we all know about the Meerkats don’t we? 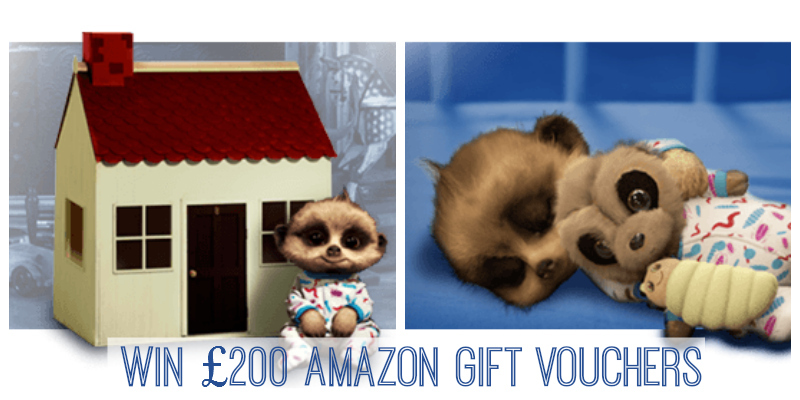 Compare the Market have very kindly offered the Love Chic Living readers a chance to get their hands on £200 of Amazon vouchers by entering the giveaway below. It’s very simple, just follow the Rafflecopter instructions, and you can’t go wrong. I’ve used Compare the Market before, many times in fact. When we needed new car insurance of course, and more recently when we had to renew our home insurance (see here). I’m quite particular about the level of cover we get, and think it’s so easy to underestimate how much it would cost to replace all of your home contents. It really is important to get this right, or at least get cover that gives you a blanket value that you know will be adequate. Many years ago, my husband was burgled twice in the space of a few months, losing all of the replaced items in the second event. It’s made us quite cautious, and ensures we don’t skimp when it comes to finding the right home insurance cover. Anyway, less of the serious stuff, let’s have some fun! The prize is £200 Amazon Gift Vouchers. There is no cash alternative. Competition closes on Tuesday 27th May 2014 11pm. The prize will be sent by the Compare the Market PR company. My photos of my family, my certificates and also my computer and my phone. Couldn’t pick one! My favourite possession is my front door key. The key to my house is the key to the happiness that lives inside. My favourite possession is a necklace my mum gave me that my nanna gave my mum on her wedding day in 1963. My computer, then my bed. My laptop! Got all my photos on and loads of other stuff! I agree with others on this blog. My laptop and photographs. Irreplaceable. All the technology that connects me to social media and the internet, I have to spend a lot of time indoors and this helps the experience feel a lot less isolating. Sadly I have to say it’s my computer as it allows me to work from home, keep in touch with others & it provides a source of info and ideas. The most favourite thing in my home is my home itself. After a difficult few years I now own my own home by myself so its the beginning of a new life for me. My most precious things in my family home are my 3 beautiful children and my husband, when they are all tucked up safely in bed fast asleep. Thank you for running such a great competition! my beswick sausage dog figure. There’s sooo much! I’ll plump for my external hard drive though – so many pictures of my children on there. My PC – I would be lost without it !! My american style fridge freezer combination that holds everything at the perfect temperature. It must be my laptop because it’s the only thing that really annoys me when it’s playing up! My computer – I suppose my husband is not a possession! My pets are my most tresaured possessions! My laptop, it has everything on it! My books, lots are signed by authors. I don’t really have a favourite possession at home. So many things but definitely my family and family photos. My favourite possession would be my family, my dogs and numerous Applpe producs. photos, which are my memories. I’d be lost without them. I would say my son but he’s not really a possession so my laptop would be my next choice. my American fridge freezer- it sings and dances! My PC. The internet plays too great a role in my life to be without it. I get withdrawal symptoms when I go on holiday. Oh gosh that is so hard, my guinea pigs as they couldn’t get themselves out if something happened or if you mine inanimate object then probably my photos. My Micro Machines Millenium Falcon. I live online, so it’s gotta be my laptop. My laptop – it’s full of photos and videos of my son. My bed and my photos. My most treasured possession would probably be my children’s memory boxes – full of photos, paintings and fun. 2 pewter table lamps I bought in a fit of extravagance years ago! My favourite possession in my home?….is an antique heavy brass fly ornament! My mum had it when I was born,m and before that her dad had it for years, and once I hit my sister on the head with it when we were little )whoops_ and now I keep on eye on it to make sure my lad doesnt do the same to his sister! Weird, but I love it! Photographs of my family, especially my daughter when she was the local Carnival Queen, and when she abseiled for charity. That would have to be my laptop – I’d really be stuck without it! My books, I’d never get to sleep without a good read. Has to be my family photos something i didn’t have when i was growing up. My cookbooks and computer without them i would be lost. I just need my binoculars and scope to see. Laptop,my world in a small plastic case. my laptop – i need it everyday! Has to be my ice cream machine – great at cheering me up when required! Definitely my laptop – I would be bereft without it! my laptop, don’t know what I’d do without it! Without a doubt my bed!!!!! My most treasured thing is a toy pram that belonged to my granny, it wasn’t new when she got it so could be anything between 80 – 100 years old, maybe more. Its lovely. It has to be my Dad’s necklace and wedding ring which was given to me after he had passed away. I can’t live without my Kettle! I know I could boil water on the hob but it’s so much easier with the kettle. i try not to be materialistic but i do treasure the dishwasher! My grand piano, worked very hard to get it so it’s symbolic. My favourite possession is my laptop, I would be lost without it! My laptop! I cried when it broke down! my bed, my pc – superb! That would be all the photos etc. of my family (apart from my family itself), so I’d have to say my laptop! a lovely sea-blue mosaic mirror i got years ago from the pier. makes me thing of holidays! Probably my NAS. All my photos and music are on there. My favourite possession is my laptop which holds all my pictures of my children growing up over the years. My books give me the most pleasure so I choose them. I have an antique telephone from my mom’s house which is very special to me. Got to be my Fender Guitar. My IPhone, can`t do without it. Family is the most important, you can`t replace them. It would have to be family photos, especially the ones of my boys and my dad. Must be my computer, so I can keep entering great comps like this. My satellite receiver because I can watch lots of foreign tv on it! My camera and my photos. It`s got to be my Playstation. My collection of history books. My computer and the contents on it. My laptop (and of course its Internet connection). My heatpad, I hate the cold! Otherwise it has to be all my dresses! Family photos and my pet rats! The toys I have from my childhood. My PC as it has all my photos on it, but I have to say the first thing I would grab if it came to it would be my scan photos of my son when I was pregnant. My bed – appreciate sleep much more since having kids! Ahhhh. This is a tough one – My laptop or bed! My beloved CD collection – just don’t remind me how much they cost! My favourite itm is my PC!!! My cat. Though I’m not sure she’s a possession, she’s the second most important thing (the first is my partner), and keeps me sane! My heated dinosaurs! I am usually always cold and pop one of these in the microwave and warmed up in an instant! One of the pictures I’ve bought whilst travelling, they’d be extremely difficult to replace. My portable DVD player and DVD collection. My other half, of course, and a beautiful picture tile from Greece that my dear departed sister gave me from a trip of hers when I was nine or ten I think. Family, I don’t own them but without them, nothing matters. My print of Jongkind’s ‘Rue de St Severin 1889’ – I could spend all day staring at it! My most prized possession is definitely my ever-growing collection of fantasy novels. My favourite possesson is my kindle! my computer – communications central! Definately my laptop, my entire life is on it. The photos of my children when they were babies. Definitely has to be my TV! My family but my bed comes a close second! My fridge because its bright red and funky looking! My laptop is probably my favourite and most used! Without a shadow of a doubt my beloved laptop – it’s a bruised old chap, but the one who stores most of my digital memories and soundtracks. My Bed because it is so comfortable – Love going to bed!! I love my big comfy sofA. My box of photos and other little keepsakes! I’ve taken them everywhere I’ve lived and only the most important things make it inside! Would have to be My ipad! Definitely my bed. So comfy and my little haven. It has to be my computer as it holds all my travel photo memories, without these I would have no life especially as I can’t have children !! The sofa in our living room where I gave birth to my daughter! A small nest of tables which has been in my family for years. Our huge bed. Just a shame my little one doesn’t want me to sleep all that much!! A large wall picture of me and my two children. Dishwasher, means I have nicer hands! My sofa – i spend enough time on it! My laptop – it’s my passport to communication (especially my son who lives abroad), information and most importantly where I store all our photos so it’s a trip down Memory Lane too! Old family photo albums, I think most other possessions can be replaced. Tell me, what’s your most favourite possession in your home? My laptop, what would I ever do without it! My bed, it is my haven. My diary, which I’ve been keeping since I was 11. My laptop, I would be lost without it. Definitely photos and videos of the children. You just can’t replace them. My children’s photos and videos of them growing up. You just can’t replace them. My shower cubicle – I waited so damn long for it to be installed! My kindle, I’d be lost without it. My phone. It is permanently glued to my hand! Our sofa, its definitely the heart of our home, perfect family time, chilling out, chatting, its large enough for our family of four to all snuggle up on. Not sure I could live without my computer! If we are talking possessions rather than family I would have to say the laptop! Photos/laptop with all the photos on! Would have to be my laptop! My favourite possession would have to be my oven! Without it I wouldn’t be able to create some of the tasty treats I make! very random but love my big fishtanks! find it very relaxing to watch the fish swim about at night!! My bed! It has a fab purple headboard and is so comfy. definately my laptop which I used for entering comps ! Ohhh I love this question! I think it would have to be my desk! My wedding photo album – we only just got it after getting married 18 months ago! Love to insure my sanity, home is a crazy place. My laptop and my kindle. my 2 cats ! Daisy and Kitty – Meow! Has to be my pussycat – closely followed by my laptop! A 1950’s diner style red bar stool, it gives my kitchen a lovely retro vibe. Has to be family photos and mementos. My cuddly lion that I’ve had since the day I was born! My 12 year old now owns it! My books – like a library in my house! Apart from my darling wife, my SKY TV and comfy sofa! My bed, really I love it! Definitely my collection of old photos. A painting (etching) called Dream by Simon Bull which my Hubby bought me for my birthday 12 years sgo. A war relic from an ancestor, a sword from the Boer War. The cat! Though he wouldnt like me calling him a possession! My collection of vases… I have a handmade wooden one from Jamaica which is beautiful! My dog’s (they are my family really not possessions! My favourite possession would have to be my tv! my sofa so i can lie on it and its so big my 4 kids can fit on it and mu hubby. My favourite possesion in my home is my bed! my computer, couldnt be without it ! My phone which I’m never without. My well researched family tree. A vase that was bought for me by my best friend. My kindle – it goes everywhere with me. My photos – sadly they are things that cant be replaced by insurance. A set of ornaments given to me on my 40th birthday – a mother and boy and a separate girl with flowers. My family and my dog. My favourite possession is my Winstanley cat. Found your site via Ebay of all places – enjoyed having a look around. All of my gorgeous cats – they make my house a home! My record collection that I’ve spent alot of time, and money building up. I’d be lost without my laptop! would HAVE to be my engagement ring & laptop as that’s were all my photographs are stored and with me having a bad memory that is my brain! Either my computer or my books. I need them both. A chest I got from my grandfather. my nail polishes there is rather a lot, and i get like Golum …. my precious! My lovely Laptop is a real boon. All the photographs and mementos I have of my children growing up. My most favourite possession in my home is my washing machine. My macbook…and my bed! Without either i’d be lost after a hellish day at work! Apart from the obvious sentimental ones, like photo albums, phone with all your information in one-easily-lost-notbackedup-basket…etc…I would choose my dishwasher. It just saves me so much time! photo albums, so many memories from too many years! My PC ,I do everything online ,ebay ,banking,competitions,research and shopping. my iphone of course !!! Has to be my solid oak fish tank! My hubby and our cat! A statue of a glittery dragon riding a motorbike that my son bought me on his first school trip when he was 4, with all the money he had. My kettle cos I’m not human in the mornings until I’ve had some tea,then my computer and then my kindle. It has to be my books, I always have one on me. My laptop. My portal to Narnia. I’ve got a memory stick with all the photos and little video clips I have taken of my sons. I would be devastated to lose it. I have an old corner cabinet that belonged to my gran. My bed, painted by me and so comfy! My computer as it contains all my photos and recent memories! Definitely my laptop – it has my life on it! I would have to say my bed! My sanity. I have been clinging onto it for years! My laptop because you can do so much online. The most precious things in my home are all living and breathing. My husband and dog, however if you want an object it would have to be our bed! My photographs as they could never be replaced. My Dogs, tv and computer. My tablet because I keep lots of photos and info on it. My ipad – I’d be lost without it. Obviously the favourite things in my home are my family and my pets, but my favourite “possession” is a ring and a pair of earrings. I had a ring left to me by my mother but it was too big for my taste. As I wanted to actually wear it and not just keep it locked away, I had it altered to make a half-band diamond ring, with a pair of diamond studs. Reminds me of my mum everytime I wear it. My Bed, so hard to get out of..
A Painting by a Northern Artist of the City I grew up in. It is sad to say, but my favourite possession is my computer. I am a passionate writer and it helps me be creative. My laptop, 2 years old and got faults but I don’t know what I would do without it! I would have to say my crazy dog always brings a smile to the faces of our family. It’s not really one thing, but all the bits and pieces my children have made for me over the years! My family photo album – so many irreplaceable memories! My favourite possessions in my home are my bed and matching furniture. I finally felt like a grown up when I bought it! my iPad, I’d be lost without it! My Grandmother’s collection of little turtles and frogs. I would have to say my laptop because I use it all day every day! If pets count as possessions then my collie dog Dot! If not then something sad like my TV. But thats because it does everything (music, tv etc)! Probably my laptop. It keeps me in touch with everyone and stores all my photos. My space …. and my 6 CD towers! My space! Also my 6 x CD towers! My son, too precious for words! my PC is most precious! My dressing gown. Totally worth it, but wouldn’t be without it! Copies of old family photos which aren’t stored online and my daughters favourite dolly, Jake. my cat ……….. lol. also treasured pictures. My laptop with all my music on! Definitely my Laura Ashley bed!! My favourite possession would have to be my food mixer / blender – I use it every day! From grinding coffee to beating cake batter … it’s my best friend (well, kitchen-wise, at least)! My laptop – I’d be lost without it! Hard decision, but probably my laptop as it holds ALL my photos. I really should back it up. My dog Eddie, I have waited 48 years to own a dog and I have had him for 3 months now. I can’t imagine life without him now and would gladly give up any of my materialistic things to keep him safe and happy. Bed – going there in a min after a long night shift! In terms of material things, definitely my computer! my bed—being a bit of a sleep monster! I have moved around a lot recently so don’t have too many possessions but one of the things I always take with me is a “This is Your Life” style photo album that my dad made for me for my 18th birthday….absolutely priceless!! My mothergoose doll given to me by my grandmother when I was just six weeks old. my swinging sofa in my conservatory, my perfect place to sit and chill. my dining table – it has been handed down through the family, and my son sits where my great great grandad used to sit when he was a child. i love it! My kettle. Need a good strong coffee before i can brave the day! My iPad – a communications portal with the world – and beyond! My nan and grandad’s framed wedding photo-it always makes me smile and remember them with love. Photos of the children when they were small and my apple imac. I am loving the wall quotes I have recently put up. Special is also my photos. my family 🙂 – if that doesn’t count, then it’s my computer lol!